On February 8,1923 the oganizational meeting of the Woman's City Club of Akron took place at the home of Miss Helen Wolle, temporary chairman, who was later elected the first president. In July 1923 the Mason House located at 115 South Union was rented and served as the clubhouse until 1926, It was then decided to move to a downtown location. The third floor of the Pythian Temple, 34 South High Street, was leased as a clubhouse. The first meeting in the new location was held on June 30, 1926. A fire destroyed the third floor on June 25, 1929. The fourth floor of the Pythian Temple was leased in September 1929 to handle the Club's growing needs. The clubhouse remained at this location until April 1946. In 1939 the Club was re-incorporated as a non-profit organization and became known as the Akron Woman's City Club. In 2006 the Club was re-incorporated as a charitable nonprofit organization. On September 19, 1945 the Board of Trustees approved a motion that the property known then as the Stadelman Estate or "Gray Lodge" be leased for a period of five years (with the privilege of purchase) from Mr. James Arthur, owner of the property. After a successful financial campaign and membership drive, work was begun at the Club in March 1946. The official moving date was June 3, 1946. The gratitude and appreciation of all members goes to Mrs. L. A. Graham, who was president from 1945-1947 during this period of transition. The leadership of Mabel Graham, the vision and exceptional business ability of the Board of Trustees, and the support of the membership brought city-wide recognition to our Club. It truly can be said that - "The beauty of our house is order, The blessing of our house is contentment, The glory of our house is hospitality." 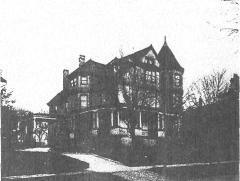 The present home of the Akron Woman's City Club was originally the home of Mr. George Bertram Work and later the George M. Stadelman estate known as "Grey Lodge'. The home was built in 1901 with a later addition in 1913, and, over a period of years, other additions have been made. Under the leadership of Mrs. L. A. Graham, the Club President, in 1945 the arrangements for purchase and necessary renovations were made. The purchase price was $30,000, and until the mortgage was fully paid, some $200,000 had been added to the cost for repairs, remodeling, refurnishing and landscaping. The Club moved into the building on June 3, 1946. Five and one half years later the mortgage was paid off on December 1, 1951, and the Club was debt free on June 18, 1952. On this date, Mr, Warren E. Carter, President of the Akron Chamber of Commerce, presented a scroll commemorating the accomplishment and expressing the pride of the community for the work the Club was doing. A mortgage burning ceremony completed the day's celebration. In 1955, a fire destroyed the kitchen which was located in the area now known as the Parisienne Room. A mortgage for $100,000 was secured. The final payment for this indebtedness was made in December, 1962 (with the group known as the 'Spanish Section' making the last payment of $864.95!). A "Mortgage Burning and Tea" feted this important event on January 30, 1963. The area known as the "Annex" was added in 1948. Additions were made to the Coach House in 1959 and 1962. The first porte-cochere was completed in 1967, the Florentine Room added in 1963, the storage area off the Ballroom in 1966, and the elevator was completed in 1998 along with the present porte-cochere. There is some doubt as to the exact use of some of the rooms from the original estate, but general ideas as to their function can be surmised. For a period of time, the building was used as a nursing facility and several owners preceded our ownership. The Ballroom, Crystal Dining Room, Florentine, Parisienne, Terrace, Board, Presidents' Rooms and Wolle Lounge form the nucleus of the dining locations, with the smaller Junior, Americana, Rhododendron and Sun Rooms serving at times for dining and/or meetings. The Gallery, which had been the library, is a fitting place for art displays and small receptions. Members and guests are suitably impressed with these popular locations which have been attractively, as well as practically, decorated and are maintained by a staff who care for them lovingly. The second floor, with its rather formal upper hall decorated with period furniture, serves a number of purposes: dining, meeting, lounging, a manager's office, service rooms, and the core of our business office, is a widely used area. Recent redecoration of some of these rooms (as well as some of those on the first floor) has added to the importance of the operations of the Club itself. The present office area, (adjacent to the Wolle Lounge), complete with marble walls, had been the master bath, with the Lounge having been the master bedroom. The Lounge itself had several closet sections, one which was used as a vault storage for furs, silver, jewelry, etc. Numerous closets, cabinets, drawers, etc., on the second floor provided ample storage for clothing, linen, etc. The basement floor of the Clubhouse houses kitchen and dining storage as well as boiler and maintenance rooms.